Heat oven to 350°F. Spray 12-inch pizza pan with cooking spray. 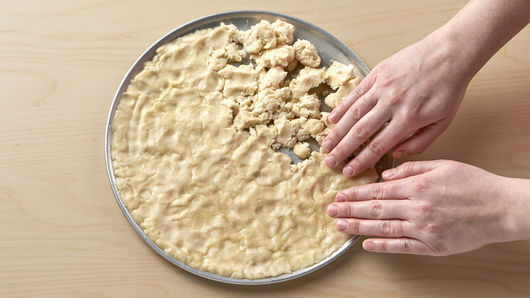 Break up cookie dough in pan; press dough evenly in bottom of pan. Bake 12 to 16 minutes or until golden brown. (Center will be soft, but will set during cooling.) Cool completely, about 30 minutes. Arrange fruit over cream cheese. Stir jelly until smooth; spoon or brush over fruit. Refrigerate until chilled, at least 1 hour. To serve, cut into wedges or squares. Cover and refrigerate any remaining pizza. Like other refrigerated doughs, cookie dough likes to stay cold until it’s ready for the oven. 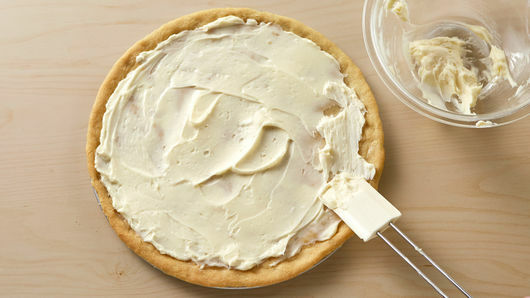 This cookie crust is an easy do-ahead; bake it up and store it at room temperature for up to 1 day. Get creative with the fruit topping—you can casually arrange the fruit over the top of the cream cheese filling or arrange it in concentric rings to look like a fancy bakery tart. Stir grated fresh lemon zest into the cream cheese filling; the tart citrusy edge contrasts will its richness and plays well with the fruit. Warm the apple jelly just a bit (5 to 10 seconds) in the microwave, so it stirs up smoothly for glazing the fruit. You can also use currant or raspberry jelly if you'd like to switch things up and use fresh raspberries on top. Drizzle the melted jelly over the fruit with a small spoon or use a pastry brush. Is it a cookie? Is it a pizza? Or is it something else that’s deliciously in-between? No matter how you categorize it, everyone can agree that fruit pizza cookies are brilliant. Easy to prepare and simple to serve, this is a recipe that delivers a burst of freshness and a pop of color to the table every time it's made. 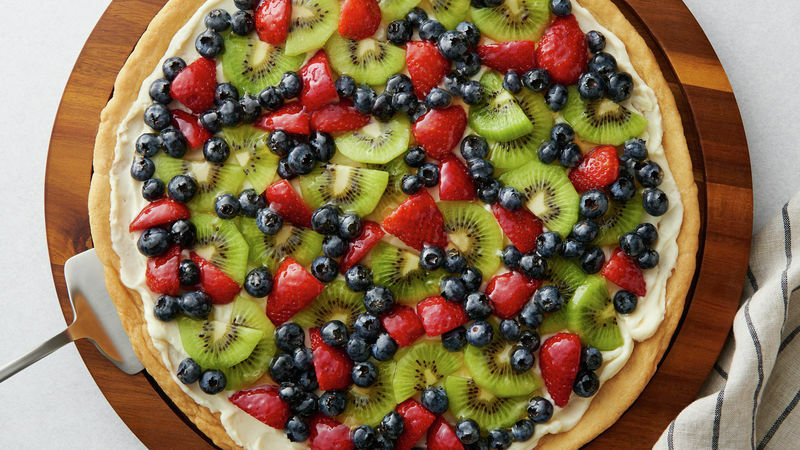 The fruit pizza frosting is sweetened cream cheese, and the choice of fruit is totally up to you. 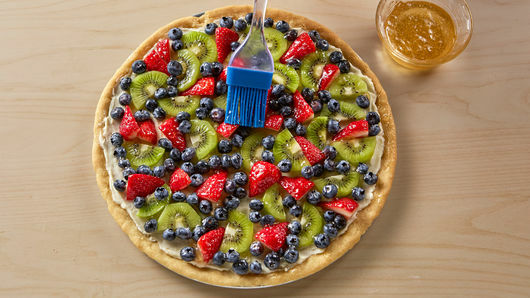 If you’re feeling fancy, you can garnish your fruit-topped pizza with white chocolate drizzle, chocolate syrup, caramel sauce or a variety of fruit purees for added color and taste. Want to try out Nutella fruit pizza next? Browse our fruit pizza recipes for ideas. Or, if you want to sharpen your general pizza skills, reference our how-to guide for making pizza at home.